Klemperer-Johnson teaches beginning students how to make a sawhorse. The first task sounded so easy: Use a utility knife to carve a sharp point on a carpenter’s pencil. But holding the blade at just the right angle proved tricky, and my point wasn’t quite sharp enough. When I used that dull pencil to measure and cut a piece of wood, my line was a little too thick, which meant the cut was slightly off. Not a deal breaker for the sawhorse I was building, but it could be a bigger problem if I were trying to make an Adirondack chair. Precision sometimes matters. 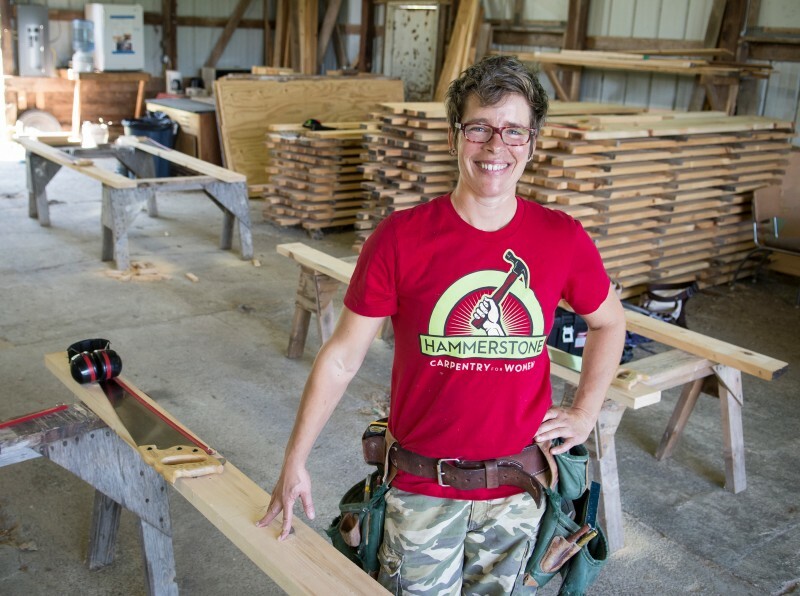 That was my first lesson at Hammerstone School’s two-day Basic Carpentry Skills course in Trumansburg, N.Y. Maria Klemperer-Johnson, ’97, founded Hammerstone to teach building skills to women, which she believes bolster their confidence in all areas of their lives. The fact that I built anything at all is somewhat stunning. Before taking Hammerstone’s course with seven other women, my construction résumé was short. I struggled to use a drill to hang pictures on the plaster walls of my 1776 Connecticut home. I had never used a power saw or built anything that wasn’t from IKEA. Now my classmates and I know the satisfaction of constructing something from scratch, amid the sweet perfume of fresh sawdust. We can safely use a circular saw and know when to use screws instead of nails — and when using both would be best. Most important, we completed the course with all our digits intact. Klemperer-Johnson has been building since childhood. At 10, she says, she was “deemed mature enough” to create intricate castles and cathedrals with her grandfather’s Steinbaukasten (stone blocks) and a couple of years later, she and her father constructed a music stand together. Moreover, her mother was the family’s primary breadwinner, which gave the young Klemperer-Johnson the freedom to think beyond traditional gender roles. 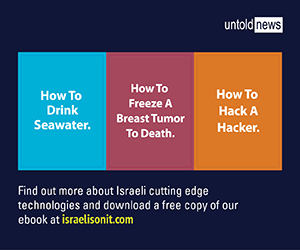 She majored in computer science and minored in geology at Stanford, then joined a Seattle-area technology start-up. After stints there and in North Carolina, Klemperer-Johnson headed to Cornell to pursue a PhD in geology. But the program — more theoretical than the field trips to Death Valley she had enjoyed as an undergraduate — failed to hold her interest. As Klemperer-Johnson looked for a new path in Ithaca, she felt drawn to the building trades. For a couple of weeks, she worked alongside the carpenter she was dating at the time, then found her own gig with a local cabinetmaker. Women are empowered by developing skills such as carpentry, Klemperer-Johnson says. Even before she was officially hired, Klemperer-Johnson got her first whiff of the sexism prevalent in the field. She recalls her prospective boss telling her, “I’ve had women work for me before, but I need to check with my wife first.” Still, she counted herself as somewhat lucky: “Often women don’t even get called back,” she says. By 2009, Klemperer-Johnson was running her own building business. Along the way she had three children, now 11, 9 and 6. In 2013, she added a new baby: Hammerstone School. The school grew out of a collaborative project, suggested by a local resident, to build a tiny house. 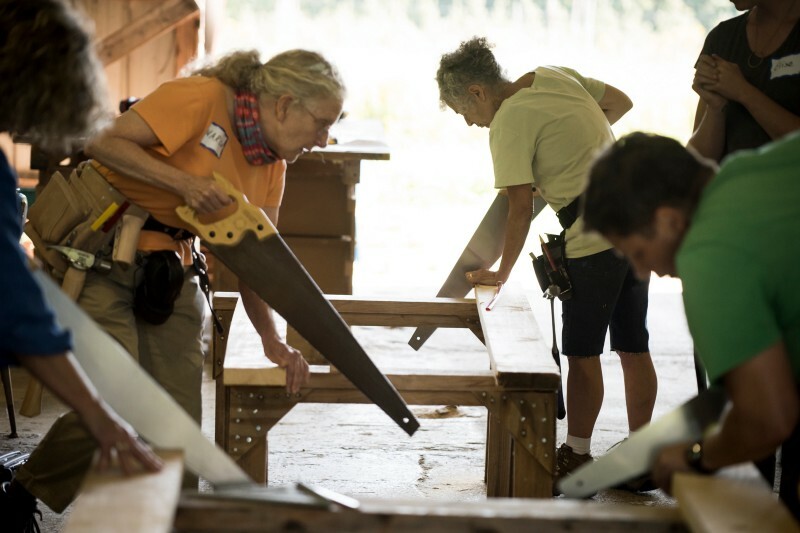 As Klemperer-Johnson trained the women working on the house, she realized how much carpentry instruction boosted women’s skills and confidence. Five years later, she has taught roughly 300 women. More than 100 of them participate in a Hammerstone alumnae Facebook page, asking for help with projects and celebrating successes. In March, Klemperer-Johnson brought a crew of seven Hammerstone-affiliated women to Puerto Rico, where they worked to put metal roofs on houses that had been covered with tarps since Hurricane Maria last fall. She hopes to engage in this collaboration long term, educating local women in trades work to help alleviate the shortage of construction workers that has delayed rebuilding on the island. Klemperer-Johnson begins her classes in Trumansburg by asking each student why she signed up and what fears she brings with her. One of my classmates, 28-year-old Jasmine Burns, introduces herself as a metadata librarian at Cornell University; she has two master’s degrees and publishes in her field. But when Burns and her husband asked her uncle to help them build a shed on their rural property near Ithaca, she was in for an unfortunate awakening. Both she and her husband stood ready to help, but Burns’s uncle gave instructions only to her husband, ignoring her. “I wasn’t included in the way I expected,” she says. Troublesome gender dynamics have brought more than one student to Hammerstone. Some women, Klemperer-Johnson says, are hoping to build their confidence after extricating themselves from difficult relationships. Others’ motivations vary widely. Our class includes Shira Burg from Pennsylvania, who hopes to use her newfound skills to volunteer for Habitat for Humanity, and Meg Meixner, who lives just a stone’s throw away and wants to be able to work on projects around her house. Meixner’s nursing toddler came to visit Mom during our lunch breaks — just another hint that this was a different kind of carpentry class. Women have varying motivations for attending the courses. Many hope to build confidence. As Klemperer-Johnson gently guides us through the math of measuring angles, we are reminded that in carpentry, brawn doesn’t necessarily matter more than brains. It has been nearly 30 years since my last math class, and I need to dig up sin=opp/hyp from the deepest recesses of my brain. Klemperer-Johnson is tall and powerful — she was on the rowing team at Stanford — with cropped hair and earrings made of hex nuts. She admits that some of her physical gifts benefit her carpentry, especially her strong hands, but she welcomes everyone from teenage girls to senior citizens in her classes. “Our advantage as women is we always need to think about how to do things smartly,” she says as she demonstrates using her hips and shoulders as levers to hoist an awkward piece of plywood aloft. Even the strongest man, she says, eventually bumps up against his limit. From the start, she encourages women to learn clever, practical tricks to prevent injury and use their bodies well.